Physical Description A solid frame accentuated by a daily workout routine. Piercing green eyes hides the fact that one is artificial. He has a Borg cortical implant on his temple. Hobbies & Interests Accomplished trumpet player, a skill he learned from his father. Known as a highly skilled dom’jot player and loves to read books and listen to old Earth ragtime and jazz music. Personal History Vox Templar was born near San Diego, California, Earth. His father was a Starfleet officer. 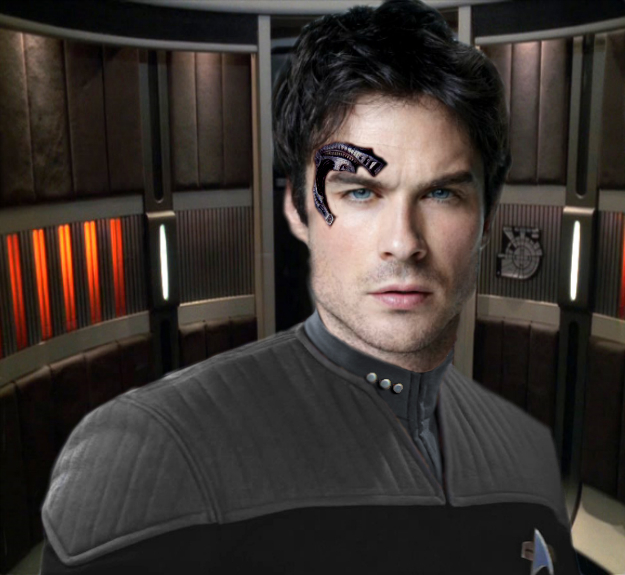 John met R’nal while serving aboard the USS Cerberus. The ship was tasked with aiding a damaged Romulan ship transporting dissident refugees away from Romulus. Upon rescue, R’nal and John fell in love and were married. Much of Vox’s early childhood was spent following his father through various postings, with vacations home to Earth. Vox decided to follow his father's footsteps and joined Starfleet. While initially assigned to the USS Kyushu, Vox lost his fiancé Lyndsi Johnson during the Battle of Wolf 359. Later, upon assignment to the USS Mercutio, he married Stacey Templar by Capt. John Harrison. It was while being assigned to Starfleet Intelligence that Vox and Stacey had a son named Kevin. Since their retirement from Starfleet, Vox learned what it means to be a father to the son he never met.